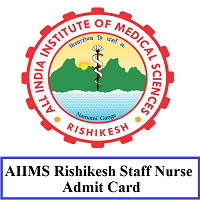 AIIMS Rishikesh Staff Nurse Admit Card 2019 is Released by the All India Institute of Medical Sciences (AIIMS) Rishikesh. So, candidates who are ready to attempt the AIIMS Rishikesh Staff Nurse Examination must check this page. Many aspirants applied for the post and it is stated that the examination will be conducted on 4th February 2019 – 8th February 2019. So, aspirants make sure that you download the admit card before appearing for the examination. Therefore, download your AIIMS Rishikesh Staff Nurse Admit Card 2019 from the given link which appears at the end of this page. AIIMS Rishikesh higher authorities released the AIIMS Rishikesh Hall Ticket 2019. Candidates preparing for the examination should carry their valid hall tickets to the examination. Also, this page offers you with the complete details including the exam date, download link, selection process, steps to download the admit card. You can either visit the official website i.e., aiimsrishikesh.edu.in or you can directly download it using the link given below. There are totally 668 posts for the Nursing Officer (Staff Nurse – Grade II)Posts, Office Assistant, Personal Assistant Vacancies. Hence, interested aspirants can take this opportunity and attend for the exam. The selection process mainly consists of the Written test, interview, and documents verification rounds. Aspirants who clear all these rounds will be recruited for the corresponding posts. Also, there are some mandatory documents to be carried to the examination center. The detailed information is available in the below sections. List of the important documents is given below. Carry any of those documents to the examination center. Candidates should first visit the AIIMS Official Website – aiimsrishikesh.edu.in. On the home page, you can find the exams section and also the latest news section. By entering into those sections you can find the link to download the hall ticket. Also, candidates can download the admit card by using the download link given below. Click on the link given below, then you will get a login form to be filled. Enter the application number and the date of birth. If you forgot the password, then you can click on the forgot password button. Then you will get the recaptcha. Fill in the user id and the recaptcha and click on the get password button. Then you will get the password. You can download the AIIMS Rishikesh Staff Nurse Admit Card and take print out of it and carry it to the examination. Candidates preparing for the examination do not forget to download the AIIMS Rishikesh Staff Nurse Admit Card. Hope that the information provided is useful for your reference. For any further information, you can contact us at freshersnow.com. All the best for all the aspirants.